M40 west to junction junction 3A. Join M42 northbound. Exit M42 at junction 4 and continue on A34 (signposted Shirley). Continue through Sparkbrook where the A34 becomes the A41. At the Camp Hill roundabout take the 3rd exit (s/p Ring Road and North) to join A4540 Sandy Lane. At the next roundabout go straight on (s/p Small Heath) for St.Andrews. Parking is mainly street parking but make sure that valuables are kept of out sight due to some problems with car crime. Train: Birmingham New Street station is approx 2 miles from St.Andrews with trains served from London, Euston or from High Wycombe via Banbury. Birmingham Snow Hill Station has direct connections from High Wycombe (journey time just under 2 hours) and is approx 2.5 miles from St Andrews. Bear in mind that returning from evening fixtures is not really practical. Check www.nationalrail.co.uk for specific times and connections. Gary Ablett - loan spell at Wycombe in December 1999 from City. Four years with City after long spells with Liverpool and Everton. Moved on to Blackpool after Wycombe but left the full-time game in May 2000. Trevor Aylott - Spent time with Millwall, Crystal Palace and Bournemouth before moving to Birmingham in October 1990. Made three Conference appearances for Wycombe in March 1993 on loan from Gillingham. Mark Cooper - Former City midfielder who spent a very brief spell at Wycombe on non-contract during January 1994. Moved to Exeter City after Wycombe and eventually found his way to Hednesford for season 2000/2001. John Cornforth - Joined Wycombe from Birmingham during the 1996/97 campaign but left in May 1999 after failing to regain the form that gave him Welsh International honours. Was briefly at Scunthorpe in 1999/2000 before moving to Exeter City in February 2000. Miquel DeSouza - Scored 29 League goals in three seasons at Wycombe after an unsuccessful spell at City between 1993 and January 1995. Has since played for Peterborough United and Rusden and Diamonds. Joined Conference side Boston United in 2000/2001. Steve McGavin - short spell with City after Barry Fry took him from Colchester. Wycombe paid �140,000 for his services in March 1995 but eventually returned to Colchester via a short spell at Southend United. Tommy Mooney - Had a two year spell with City after moving from Watford in the summer of 2001. Scored League 13 goals in 33 games for City during 2001/2 but was loaned out to Stoke City, Sheffield United and then Derby County during an unsettled season. Left City in the summer of 2003 for Swindon Town. Moved to Wycombe in the summer of 2005 from Oxford United and scored 32 times in just over 100 appearances before a move to Walsall. Darren Rogers - A substitute appearance at Scunthorpe in November 1993 while on loan from Birmingham City was his solitary League game for Wycombe. Moved to Walsall in the summer of 1994 and made 54 League apps before joining Stevenage Boro'. Danny Wallace - made one substitute appearance for Wycombe at the end of the 1994/95 season after 18 months with City. Best remembered for his times at Southampton and Manchester United. Tom Williams - City paid out �250,000 in March 2002 to Peterborough United for the Welshman but he made just four First Team appearances and after loans spells at QPR and back at Posh left St.Andrews at end of the 2003/4 season for Barnsley. Joined Wycombe in the summer of 2007 from Swansea City but fell out of favour and eventually returned to Peterborough later that season having made just 13 appearances in a Wycombe shirt. 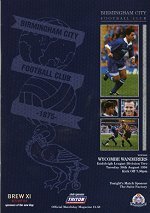 The first time that the Wanderers met City was during Wycombe's first ever Division Two campaign. City had just been relegated from Division One but they were in for another shock when a Cyrille Regis goal was enough for a 1-0 victory for Martin O'Neill's side. By the time City travelled to Adams Park for the return fixture they were promotion bound and gained revenge with a 3-0 victory but we don't talk about that.